On the 18th of this month, my mother and I arrived at the Mumbai airport after a one and a half hour long flight. The Jetlite flight we boarded was pretty much a disappointment. The seats weren’t exactly suited for my never-in-good-shape back and there just wasn’t enough leg space. The guy next to me wasn’t having the time of his life either, becuase he was going through a bout of fever and the air conditioning wasn’t exactly helping. The poor chap kept coughing, sneezing and I don’t know what, every few minutes, which kept startling me. And hence, neither he nor I managed to get a wink of sleep. And odd as it seemed, there was only one air hostess in on board, the rest were stewards. Heck. But then again, it was a plane journey and I was very happy that we got down in an hour and a half. My uncle was there to recieve us at the arrival and we made our way home. Once there I caught up with my cousins and karthu’s husband, Anoop. And soon enough, I did what I loved to do most in Mumbai… hit the sack! After lazing around the whole of the next afternoon, we got ourselves ready for Karthu and Anoop’s wedding reception. We guys were dressed in black suits. I was in charge of the photography through the whole evening and I had a gala time, talking with people, taking snaps and keeping my eyes peeled [:P]. The food was amazingly delicious, and I couldn’t help but take three helpings of the rasmalai that was part of dessert. All in all, the function went on very well and we returned that night only to fall asleep again [:P]. Damn I love to sleep. Nothing interesting here. I spent the whole day sleeping, browsing and ummm… sleeping. Mainly owing to the fact that Karthu, Anoop and my aunt had gone to some Sai Baba temple in Nasik. So there you go. Well, the morning was spent lazing around as usual. And as far as the evening is concerned, mum and I made our way to my other uncle’s home (This uncle being my dad’s younger brother) . His daughter, Aloka, was to get married on the 23rd to her boyfriend, Amit. So Amit’s family was to come over and hand over the wedding sari and well… you know the tradition right? So hence, I met his folks for the 1st time and also caught up with Aloo and her little brother, Dinku. The next afternoon, mom and I were driven over to the Chembur Gymkhana club by a car arranged by my uncle. This is where we would be staying through Aloka’s wedding. That evening, we had a mehendi party or whatever it is that you call it. It seems, all their friends were puzzled when they were told we keralites don’t have such a function. Finally they had to give in to their friends’ pressure and they decided to have one! On the club terrace, the setup was rather slick. There was a two-member troupe playing songs of our choice. More like a living jukebox. I asked them to perform Hotel California, which they were rather hesitant to do because its not exactly a song that you play with a guitar and a violin! But inspite of that, he did sing half the song to claps and cheers from the guests. All the ladies had their arms covered with mehendi and I got myself acquainted with a lot of people. Apart from the initial delay and confusion and the fact that they missed the muhurtam (auspicious time) by a few minutes, the wedding took place rather normally in the Chembur Gymkhana Club basement. I being Aloka’s only cousin to attend the marriage, put myself in charge of handling the gifts as and when the couple got them. Nothing worth mentioning here. The buffet comprised of all the traditional ‘sadhyam’ elements served on plates with banana leaves on them. All went well and Aloo broke down when it was time to leave, like most other brides I’ve come across [:P]. That very evening, was the highlight of my Mumbai trip. Aloka’s wedding reception at the Hilton Hotels, Mumbai (above, duh). 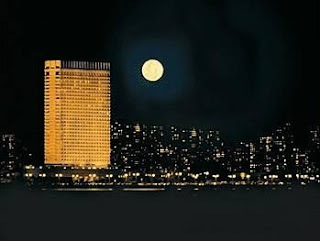 Located by the Queen’s necklace at Nariman Point, the building was an amazing sight, blanketed by lights and standing proud in the night. “So this is what Paris Hilton is heiress to eh?” I asked myself. I was in awe of the sheer amount of class that the building radiated, both inside and outside. The reception was to take place on the rooftop (35th storey) and the view from there was simply breathtaking! One could actually see the whole city from up there. And the Queen’s necklace looked fantabulous! It kind of brought back memories of Kornich, Doha. At the party, I was introduced to all kinds of people including the owner of the Apollo chain of hospitals. I even met some family friends of ours who we last met when we were in Iran. I don’t remember them a even a bit though, because I was a baby when they left the country it seems. The hard drinks section was pretty much in a rush with just one guy having to cater to 6-7 people at a time! I had two glasses of wine for myself (that’s as far as my drinking goes :P). And yeah, the food was awesome! There were around dishes different items including pasta, seafood, weird but delicious salads, Thai food, the works! The dessert itself is worthy of mention as it had four itemsfor itself. There were toblerone wafer sundaes, shahi (I cant quite recall the name) which looked like gulab jamuns in custard, but tasted different and excellent! Some kind of halwa and last but the least, roasted almond ice cream. I had two rounds of dessert [:P]. And after I bid farewell to my relatives and the people I’d gotten myself introduced to, me and my other cousins made our way home.And hence, I ame to the end of a memorable mini holiday in Mumbai. We were to leave the next afternoon, and thee train journey is by itself worthy of being put up as a separate post. This entry was posted in Non-Tech, Vacation on December 26, 2007 by lalithsuresh.